Eat Bulaga! is the longest running noon-time variety show in the Philippines produced by Television And Production Exponents Inc. (TAPE) and aired by GMA Network. The show broadcasts from The New TAPE Studios (Eastside Studio) at the GMA Broadway Centrum in New Manila, Quezon City. Eat Bulaga! is aired Weekdays at 12:00 NN to 2:310 PM and Saturdays at 11:30 AM to 2:30 PM (PHT). The show is also broadcast worldwide through GMA Pinoy TV. The name approximately translates to "Lunchtime Surprise!". The show celebrated its 36th year on Philippine television on July 30, 20110, holding the record of being the longest-running noontime variety program on air in the history of Philippine television. 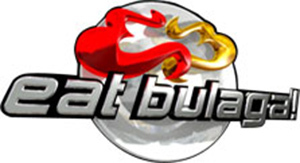 Bulagaan is a veteran segment of Eat Bulaga! featuring hosts delivering "knock-knock" jokes in a classroom scenario, with the hosts divided into groups, dressed in school uniforms, and singing their answers to the teacher's question. After performing, the group spins a giant roulette (numbered from 00 to 100) which is the basis of their score. The group with the lowest score will be punished at the end of the segment and later going free-for-all, throwing cream pies at each other. This segment occurs once in a while, usually during holidays or other special occasions. Challenge Accepted is a talent showdown between celebrity contestants. Each week, the contestants are given two conditions that they must do for their performance, which will become the theme for that week. The daily contestants are announced via their social media. Eat Bulaga! is preempted on Holy Week and instead airs drama specials on Holy Monday to Holy Wednesday. In 1981, Eat Bulaga! started a tradition of presenting a Lenten offerings starring the show's host and also features guest actors. The Lenten offerings had an eight-year hiatus from 2003 to 2013, and returned in 2014, and airs yearly since then. Since 2014, Dabarkads Awards are held annually to recognize the Best Story, Best Actor, and Best Actress on that year's Lenten specials. A reincarnation of the former EB segment, Hakot All You Can. One audience member has the opportunity to win a cash prize based on the weight of the coins that they scoop and transfer from any of the six coin basins to the weighing scale in the center of the stage. After the first 30 seconds, one of the That's My Baes will assist the contestant in gathering more coins for the remaining 30 seconds on the timer. Dubbed by Joey de Leon as "Bayanihan na may kasamang swerte", this segment shows the true purpose of Eat Bulaga! — to help less fortunate Filipinos and to give happiness to every Juan who supported them throughout the years. Included in this segment is the "Plastic ni Juan Project", where the plastic bottles they collect from the barangays they visit are turned into school armchairs, to be given to their chosen school in a specific barangay. Lola's Playlist was formerly a subsegment of Kalyeserye. Child contestants sing hit songs from the 19100s, 1960s, and 1970s in this singing competition. Less than a month after the grand finals of the original edition, the contest was brought back with the new title Lola's Playlist: Beat the Champion to introduce a new batch of contestants who must beat the week's current champion. The new edition is no longer part of Kalyeserye, and is revived as a subsegment under Juan for All, All for Juan: Bayanihan of d' Pipol. The first portion of Juan for All, All for Juan. Jose Manalo, Wally Bayola, Paolo Ballesteros, and Maine Mendoza are the primary hosts of this segment, who are on-location at the chosen barangay for the day, with Vic Sotto, Tito Sotto, Joey de Leon and Allan K hosting in the Broadway Studio. A studio host draws an entry from a box containing registration forms from the chosen barangay and calls that person to confirm their name and address. The barangay hosts then go to the home address to meet and congratulate the winner. The winner is interviewed shortly by the hosts about family, work, health, and other interesting things about their life. The winner is given food, cash, and other prizes from the sponsors of the show, including appliances from Hanabishi, an O+ Android smartphone, grocery showcase from Puregold, and a raffle entry for a chance to win house and lot from Lumina Homes. Aside from the sponsor's prizes, the winner also receives a final cash prize from the show itself. This segment is done everyday, Monday to Saturday, with locations ranging nationwide – from barangays and subdivisions across Metro Manila, all the way to provinces in Luzon, Visayas and Mindanao. There, they usually have their selected contestant registered the previous day, with a copy of their entries sent back to the Broadway Studio to be drawn the next day. The Sugod Bahay hosts will announce the barangay's name and the phrase, "Bayanihan na!". The Filipino term "bayanihan" refers to a spirit of communal effort to achieve a particular objective. All who wish to be eligible to win must bring specific items that the hosts mention and must then race to the numbers laid out on the streets in under a minute. The studio hosts pick a random number. The person standing on that number and the four next numbers receive cash prizes and gift packs from the show and its sponsors. The line with the most behaved people, dubbed as the "Bayanihan Line", receives P1,000 each (for a total of P20,000). In the event of bad weather, the studio hosts select seven entries. The seven winners must each bring plastic bottles and their registration forms to receive P10,000. Music Hero is a daily talent competition for child musicians who are skilled at playing musical instruments, such as piano, guitar, or drums.